Using old-fashioned means, Lil Grizz’s hats will keep you covered in rendezvous style! 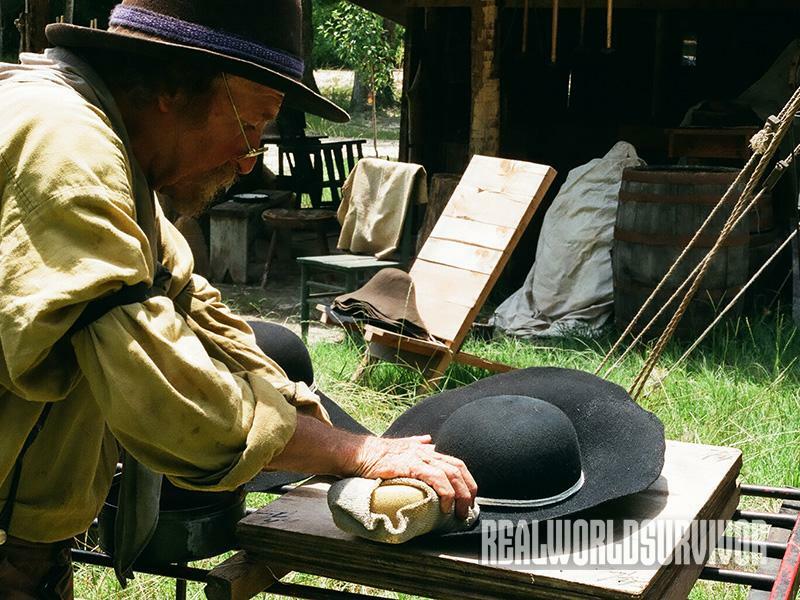 Lil’ Grizz makes custom hats by hand in his 19th century camp site at rendezvous. Lil’ Grizz began making hats over 45 years ago while he was in high school. Lil’ Grizz makes many hat styles, including colonial tricorns and top hats. 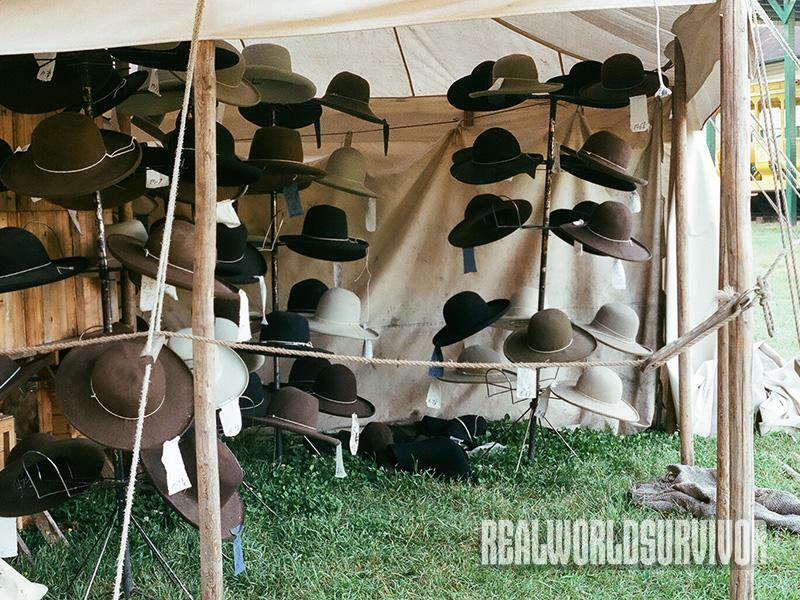 There was a time when every town had a hat maker who turned out handmade lids for the local folk. But, as with so many crafts, hat making has largely become the realm of factory-produced mediocrity. But there are still custom hatters plying their craft, and if you find one, you can get a hat made to fit the unique contours of your individual noggin. That’s something that you will never find in a mass-produced chapeau. 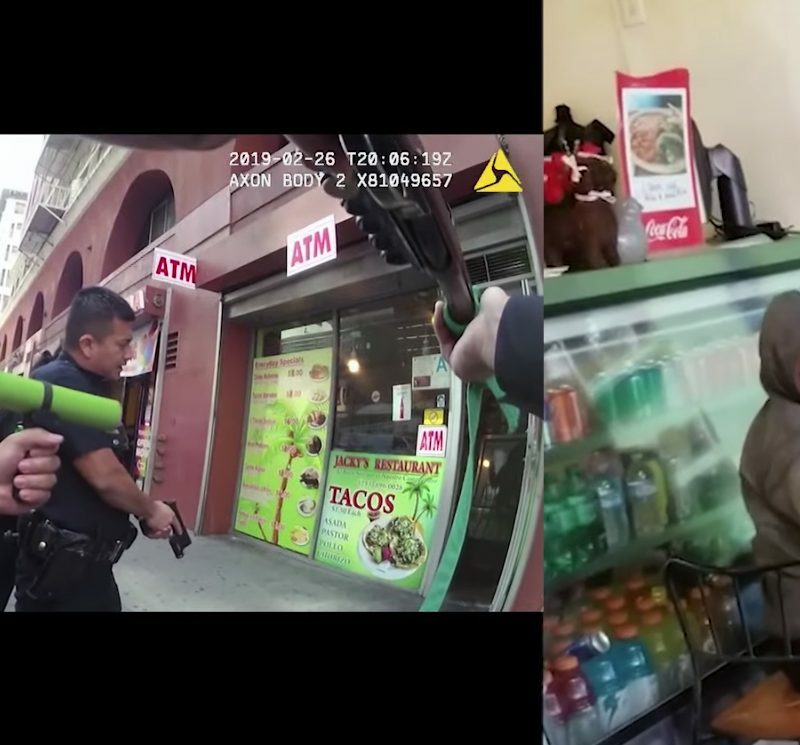 We can assume that Lil’ Grizz was given a different birth name, but we can’t prove it. Lil’ Grizz is the only name he has answered to for 30 years or more. The story going around is that Grizz learned to make hats in Alexandria, Egypt, during the last days of the pharaohs, and that he wandered the Earth plying his trade until he turned up for the first mountain man rendezvous at Burnt Fork in 1825, and he’s been living the mountain man life ever since. That tale may be true, but there’s another story out there that says Grizz started making hats over 45 years ago, during his high-school years. For the last 30 years, he has been a full-time hatter. But you won’t find Lil’ Grizz in a stuffy shop. To be honest with you, I can’t imagine any building being big enough to contain Lil’ Grizz’s personality. Grizz is a storyteller who can talk for hours and leave you entranced and feeling like time was standing still. A personality that big is best suited to life around a campfire under the starry sky—and that’s exactly how Grizz has plied his trade, and lived his life, for the last 30 years. Grizz houses his shop in a canvas tent. 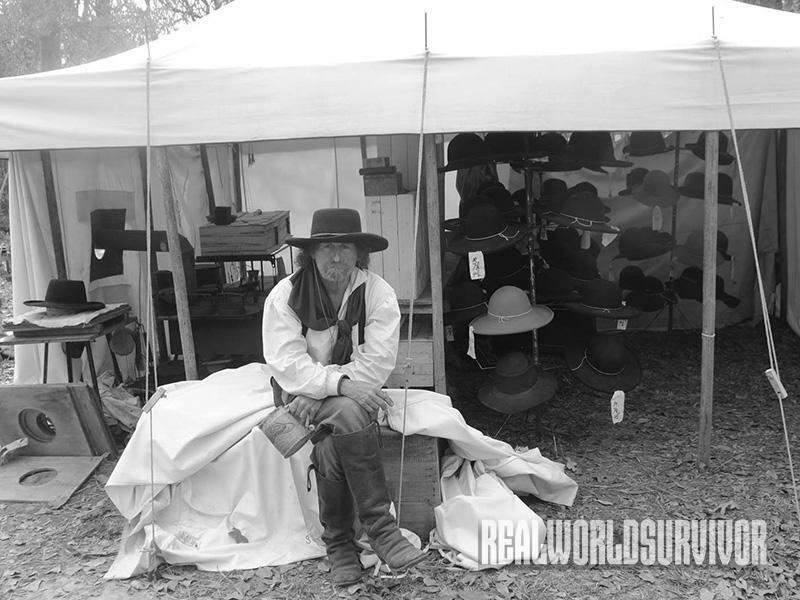 He travels across the western states setting up shop at rendezvous and major cowboy action shooting matches. He lives and works out of his tent for months at a time before heading home to spend time with his family, Miz Grizz and the cubs. Then he loads up with a new stock of felt hat blanks and hits the trail again. 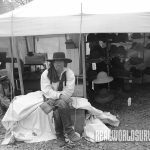 While I was writing this, Grizz was set up at the Rocky Mountain National Rendezvous in Gunnison, Colorado. 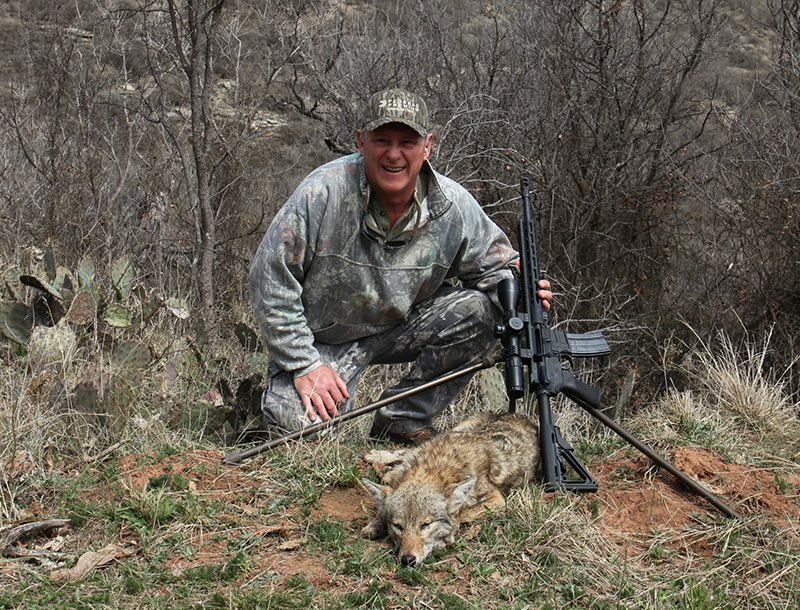 From there he was heading to Encampment, Wyoming, to set up his camp at the Sierra Muzzleloaders Shoot, and, after that, he would be headed to an event in Victor, Idaho. So, if you live out west, you have an excellent chance of meeting Lil’ Grizz and ordering a hat in person. Grizz travels with a supply of felt hat blanks that are made from 6x to 10x beaver fur as well as lower priced wool felt blanks, and he has over 20 custom hat-forming blocks to ensure your hat will fit the size and shape of your head. Most of the tools and hat making equipment Lil’ Grizz uses are genuine antiques. They have to be, because working out of a tent means equipment that runs on electric power will be useless. In Grizz’s world, you don’t plug in a flat iron, you heat it in the fire. The hat-making process starts with your head measurement and head shape. If you place your order in person, Grizz can measure your head and determine its shape. But if you order a hat by phone or mail via Miz Grizz, you’ll need to send her your head measurement and a photo of the top of your head. Almost no one’s head is round. The photo allows Lil’ Grizz to determine how oval your hat needs to be. Given the size and shape of your head, Grizz selects a shaping block from his collection. Then he selects a felt hat blank in the color you selected and dunks it into a kettle of boiling water to soften the felt. He pulls that hot, wet felt over the shaping block, stretching it into the correct size and shape. While the hat is still wet, Grizz uses a hot, flat iron to straighten and flatten the brim. At that point the hat is put aside to thoroughly air dry. After the hat has completely dried, Lil’ Grizz sprays it with a mixture of alcohol and shellac. This treatment stiffens the felt. 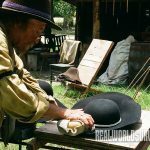 After that, Grizz trims the brim to the proper width, and he uses his fingers to put a tight pencil curl around the circumference of the brim, and to put the crease in the top of the hat, if one is called for. The last step is to sew in a sweatband. Then the hat is ready for shipment to a happy customer. 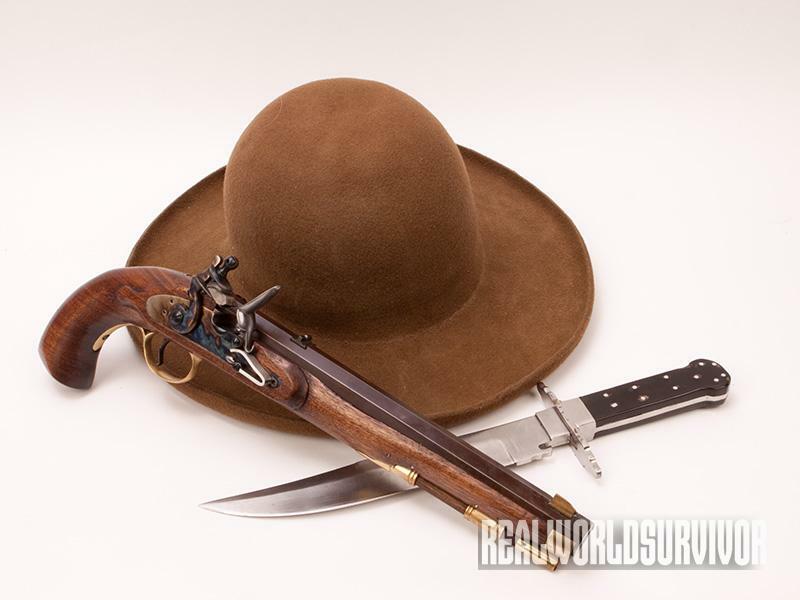 Lil’ Grizz can make just about any style of hat you desire, from colonial tricorns to top hats. 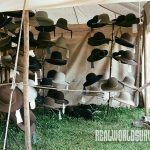 He makes lots of classic 1880s and 1890s style cowboy hats for cowboy action shooting competitors, but his personal favorites are hats from the mountain man era of the 1830s through the Civil War era of the 1860s. That suited me just fine. 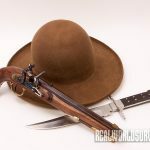 I was looking for a hat that wouldn’t look out of place with one of my flintlock rifles or with my 1860 Army revolvers, and Lil’ Grizz delivered the goods. My hat is made from brown 10x beaver felt. This is a robust material that is well over a tenth of an inch thick. Less expensive wool felt hats are often made of material that is barely half that thick. In keeping with the earlier historical period that I prefer, the crown of my hat is round with no crease. The brim is 3.5 inches wide with a gently curled edge. 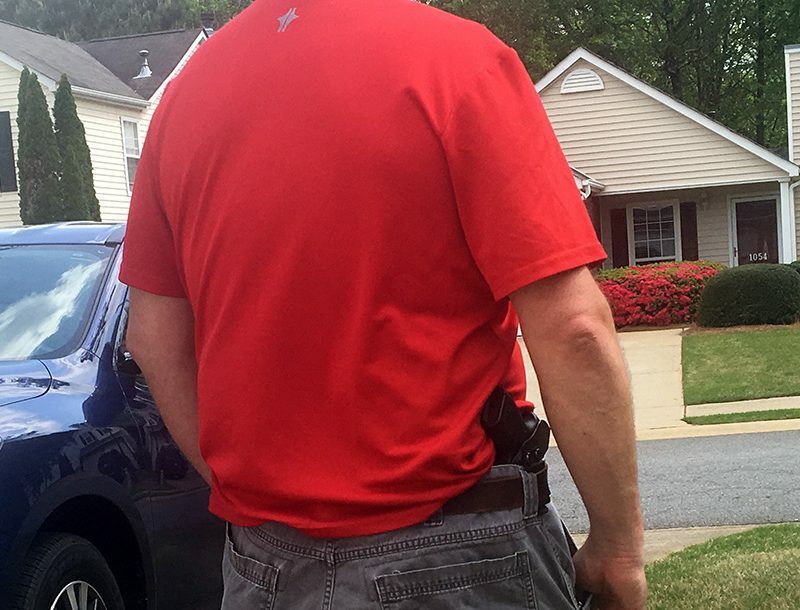 And it fits like it was made for me—which it was. There’s something about a well-made hat that I find satisfying. Knowing it was made using tools and techniques that were in use 150 years ago just adds icing to the cake. For more information, visit hatsbygrizzmadewithjoy.com. 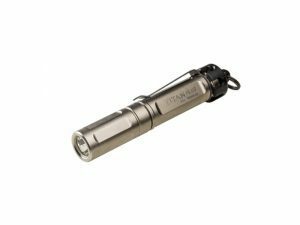 SureFire's Titan Plus is an upgrade from its Titan keychain light.